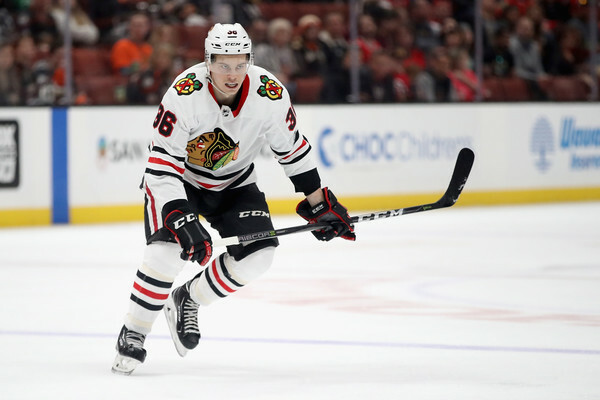 On Wednesday morning the Blackhawks responded to allowing eight goals in their preseason home opener by sending forwards Victor Ejdsell, Alexandre Fortin and Matthew Highmore to Rockford. The Hawks’ training camp roster is now down to 28, still including both Adam Boqvist and Henri Jokiharju. Ejdsell had a strong summer and prospect tournament in Traverse City but didn’t do enough to stick in the NHL right now. Outstanding signing by Bowman of Highmore out of nowhere. The guy can play. He is fast, versatile, defensively responsible, has an offensive skillset, etc… The same generally holds true for Fortin, although he seems to be slightly behind Highmore from a defensive responsibility standpoint. Oh, and I forgot, Highmore is no worse on faceoffs than most of the Hawks sans Toews. Let’s hope Sikura is all that and a slice of bread; so far, I haven’t seen it. His family is close w/ Q, he will get the longest leash possible to stick long term. Kruger & Kunitz, what can you say, Q’s security blankets; once again, Bowman signs someone like Kunitz giving Q access thereof. Martinsen is locked into the roster, this was predictable as the sun rising at the end of last season when Q was smitten with him. Again, Bowman re-signed him to a one-way deal and heaven forbid they send him to Rockford and someone claims him (highly doubtful). Highmore is a better player no question than the four forwards noted above, let’s hope he is the first recall from Rockford. All this being said, I just wasted my time typing and everyone else’s time reading this post if Crawford doesn’t get healthy soon, and even then it will be too late, the batch of the last 3 or so forwards won’t matter at all. I was insulting Marty Turco by referencing the signing of Ward as Turco II; Ward is worse than Turco was during his brief stint w/ the Hawks. Sikura AA Kampf or Sikura Kampf Saad depending which one is on Kane line. Johnson and Kruger on 4th with Hayden or Kunitz, who can bounce up and down lineup. I agree wraparound. Saad has to play in the top 6 as a $6 Million player. If he is merely a third liner, he should be traded for some much needed defensive help. P.S. If Kruger doesn’t perform close to what he did ’13-’15 Cups — and quickly — send him to Rockford. I think he is the 4th highest paid cap hit forward on the team; no other team in their sane mind is going to claim in w/ his cap hit. Let the skilled, speedy young forwards play regularly. I think Fortin, Ejdsell, and Highmore need to go to Rockford to just get top line experience, and all three need get back to the big club once our over-paid and over-hyped “Core” guys falter yet again. (i,e. Saad and Anisimov and Toews). Hopefully, Colliton will be joining them and we won’t have to watch Q play favorites, and stick with the over-the-hill gang! I’m disappointed Fortin didn’t get another game but with only 2 preseason games left it’s understandable. Hopefully he stays healthy and Colliton can teach him how to better use his speed. Lazerus posted this on his twitter feed as a potential lineup and it looks pretty good to me. Note Kampf isn’t there and Johnson is – I prefer Johnson over Kampf right now too so I like the potential of that 3rd line. Do not think it matters who’s on what line. We should be able to beat the red wings, like OTT with any arrangement. Beating top 5/10 teams, yea we need the best 4 lines arrangement, when we have goalies and not full strength D, for who we have now. BOS turned it on/around, as soon as those young prospects were ready. We will do the same when the Four horsemen are established. Let’s play with pride until then. Q said he expects to cut one forward and one d-man by end of camp and the way things look from the practice lines and who didn’t play in the game last night it may come down to either Sikura or Hayden. Most of us had high expectations for Sikura but I don’t think it would be such a bad idea for him to start in Rockford and earn his way back up to the Hawks – if that’s what happens. I don’t see Martinsen as a lock, he may be a bar like Kunitz on Toews line. If the guys on the bubble come up big next 2 games, he goes down, if not Q will be happy with him. Been in the New Mexico mountains for 2 weeks and last night was the first game I could watch. Saad was awful, uninterested, uninspired, and dare I say entitled. The Hurricanes asked for Saad in a Justin Faulk trade. I scoffed at that at the time, but would jump at it now. Ward looked the same uninterested. Made a few nice saves. But let in how many soft ones? Was like he closed his eyes for 5 seconds then opened them after the puck was past him. Boqvist can skate. Needs to beef up but he looks good. With Forsling on the ice, you wonder if 9 games is enough time to get back before Boqvist is sent back. are you sure this is Ian? and not the Insult Comic Dog??? who I actually found – maniacally funny!!! Sorry Wall no insult intended, just remembering your posts calling for his return and after he was reacquired. I don’t think offense will be an issue thi0s year and Toews and Saad and others will have much better offensive numbers. Not worried about him not looking good in preseason, most star type players don’t want to play these games but do their part for paying fans. Hoping the same for Ward but with the questions on defense, hard to be as confident. If Boqvist stays 9 games that would be oct. 23rd and Forsling return early nov. So be 6 or so game gap between. The first team that offers a 3rd round pick and a dozen sticks for Duncan Keith, please take it and run. Too old, too slow, too uninspired and he still thinks that he can make moves like he did when he was 25. The 180 was just disgusting. He got “pants’d” on that one. We are in trouble in the net if Ward doesn’t show some ability to be consistent. This could be a LONGGGGG season, boys and girls. duncan keith is the only defenseman on this roster that any other team would be interested in. His contract is very reasonable too. It would cost the hawks much more money per year to replace him. Keith and Seabrook got on the scoring sheet last night. One could also argue that both were defensive liabilities. Rough night with the turnovers. That stuff just can’t happen. Ward does not seem like a guy you want to have to count on. I liked some of the offensive stuff in last night’s practice game, but the defense was tough to watch. I don’t know what the answer is but both Keith and Seabrook just seem to look unfocused when they cannot afford to be. I’m not complaining about contract status at all. I’m just complaining about the defensive play, period. I think we should forget about defense and goalie. Were just not good/deep enough for this yr. This is a development yr. Ok. I say its the yr of the FWs. For them to get established if new, get better if 8 and 12, play with pride and as good as you really are is core. That’s the only thing we should be expecting. Then over these next 164 games the defenseman and hopefully Crow and another goalie are there. Were going to win and not win a lot of games 6-4. Were like TOR for a yr.
Mo, Nalimov was late sign in KHL with a weak team from China. He has a .283 gaa and .917 save % througj 4 games. I think it was 122 saves and 133 shots. Delia could be a surprise this year, might be a decent backup and Lankinen needs some time to see how he will do. Yea, rout for every guy. Dela got some juice going. Like that. Highmore was very impressive. Hopefully they leave him at C down in Rockford. Fortin speed very noticeable. Hands are rough, but he’s still fast. Edjsell I was expecting a bit more from him this camp. But some good time down in the minors should help.